Only 20h 46m 42s left! Welcome to the Blender Forum! exchange ideas, and interact with the other Blender users! Visit the Renderosity MarketPlace. Your source for digital art content! In order to change shape of a figure, I tried Proportional Edit on Blender 2.78c. 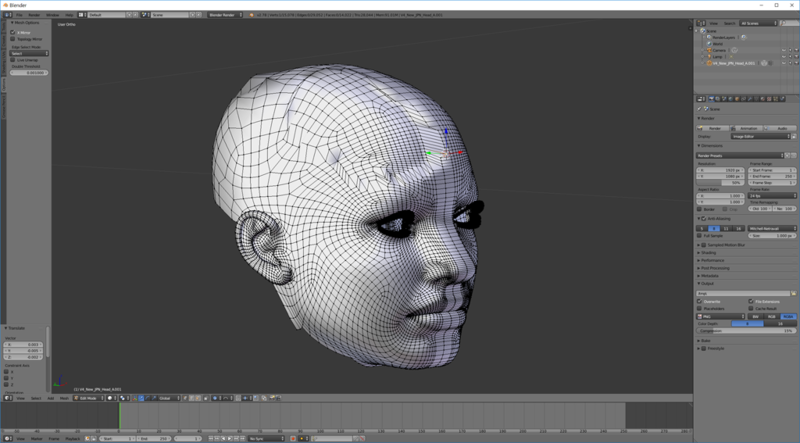 As a simple test, I selected a point on a head object, which was exported from Poser. "X-Mirror" was checked, and I specified "Sphere" option. By moving the point to opposite to green arrow, I expected that something like wen would be created. However, as shown in the below picture, head of the figure was deformed strangely. Does anyone know why it occurred? Thank you so much for suggestions! It seems there are many difficulties for what I had thought as relatively easy matters. Before trying DAZ Studio which I have almost no experience, I will try some other modeling programs which seem to have functionality similar to Proportional Edit. I tried another modeling software but behavior was quite the same, i.e. 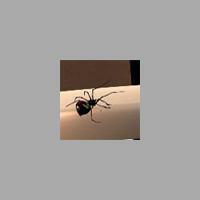 If an option of keeping symmetry was selected, then separation of object like above image occurred. If the option of keeping symmetry was not selected, then whole object translated to the direction of the mouse move. Now wonder if something wrong is contained in OBJ file exported from Poser. I have never had any luck with obj Export in poser, The fbx is slightly better and can be imported into Blender, but had issues with that as well can't remember what they were though as it has been a while. The Collada (dae) may be the best option as Blender appears to import those files very nicely and have had the least amount of issues with it. Converting from one format to another though, there will always be some issues. Maybe one day a python guru may be able to to write the script for poser to work with OD_copypasteexternal that Lobo3433 put up in another thread. Thank you for more suggestion. I exported V4 head by just selecting only Head, but unfortunately got the similar results as before. I wonder if exported V4 parts contains something extra which bothers Proportional Editing to work as designed. I now realize 3D CG world is full of difficulties for what seems to be easy thing to do. The answer is a simple one: The head you exported from Poser was not symmetrical at export. Did you uncheck all IK first ? Then clicked on ZERO FIGURE before exporting the head? Blenders symmetry function needs a symmetrical obj to start with. When the head is out of symmetry? You get the result you showed. Before starting to create a morph in Blender? Always check that your mesh is symmetrical. Bottom row => Mesh => Snap to Symmetry In the middle of the TOP row you can see how many verts are out os symmetry. The only "cure" is to re-export from Poser with the figure at its "true zero. All Ik removed and figure set to ZERO FIGURE => Then export the vertex group. 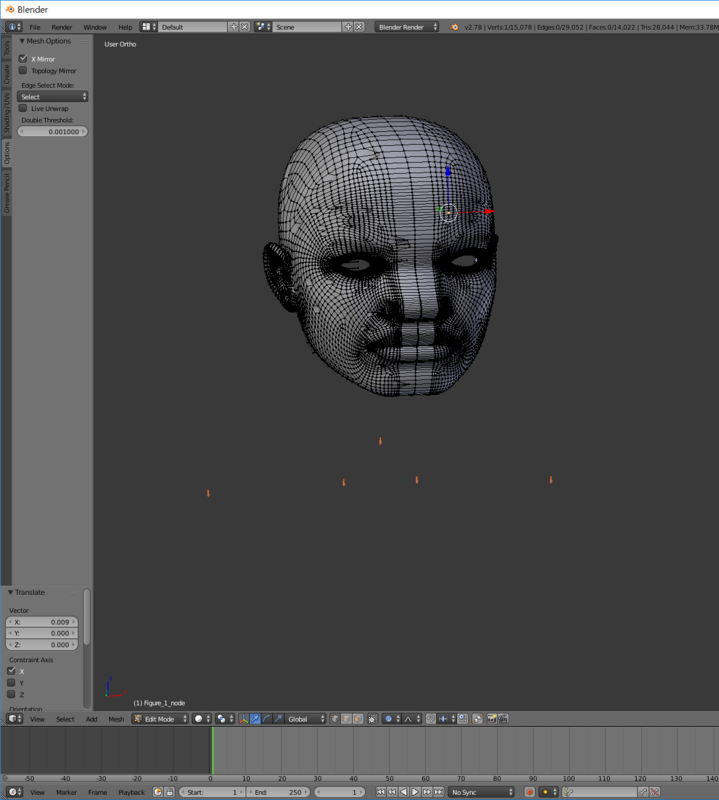 Once you exported a non symmetrical head? There is NO repair possible because you would export a non symmetrical head, repair it in Blender, and then export it as a morph target into a non-symmetrical figure in Poser shifting the complete head over to one side (or up-down, or forwards-backwards. Try to create a FBM from the default V4 obj file (as in the second part of my video). When you only work on the head, and import in Poser as a FBM => Poser will ONLY create a dial in the figure and in the head group. => There is no pollution in other vertex groups. Normally, when removing all IK and ZERO the figure should bring the obj back into its true neutral position. But. You can change the true neutral in Poser by positioning the figure and then clicking Edit => Memorise. So before export check the figure X, Y,Z, trans are all at 0.000 and that the hip is at X,Y,Z, trans 0.000. Only change these as a LAST resort because completely messing these up might require a V4 re-install. (or editing the cr2) Try to FBM from the original object file first. Actually, head Obj was exported just after V4 was loaded into the scene, and V4 does not have IK at that state. I will try FBM.